Authentic Willow Yurt frames imported from Kyrgyzstan are the most traditional frames that we offer. Made using ancient techniques, these Yurts are from round wood and as they have more woodwork in the frame they are best suited to semi-permanent locations. 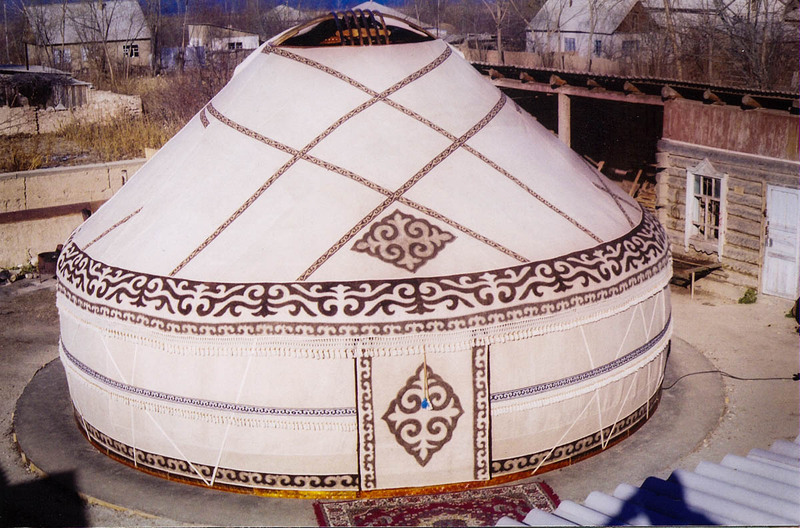 After visiting the Kyrgyz Republic in 2006 to learn about traditional Central Asian bent wood Yurt making, we started to import the tradition pure wool felt Yurt covers and bent-wood Kyrgyz Willow frames into the UK. Whilst we import the wooden frames from Kyrgyzstan, we manufacture our own high standard polycotton covers here in the UK. We use the traditional felt Yurt covers as an insulative layer if required. The Kyrgyz Yurt frames that we offer are manufactured using ancient established techniques of steam-bending, wood carving and trellis is tied using spliced raw hide. 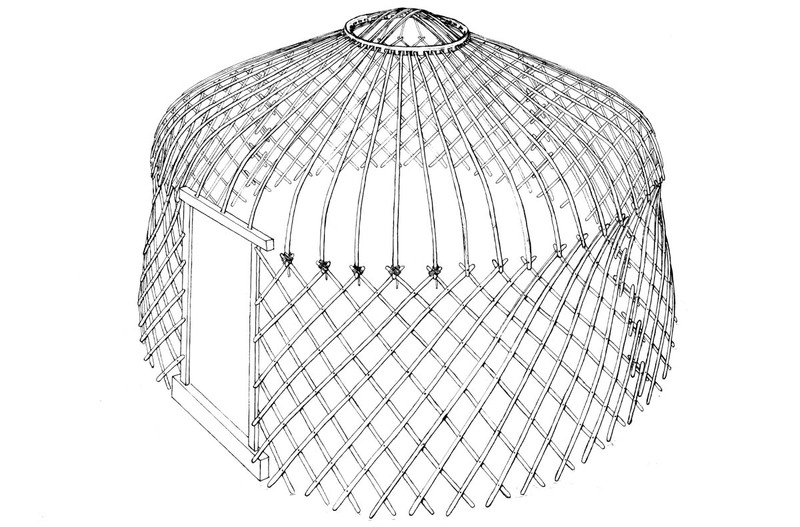 The steam bent Kyrgyz yurts have a much higher number of roof poles and denser number of trellis than many other types of yurt, making them extremely stable and capable of withstanding high winds and the weight of the heavy duty felt. This makes them ideally suited to permanent or semi permanent installations. 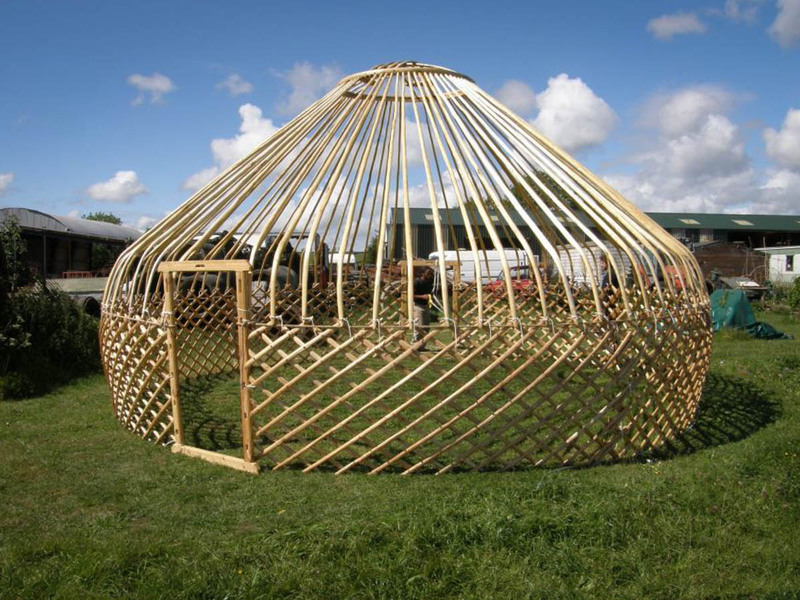 The Yurt frames are all made from sustainably grown Willow, and can either be natural wood colour or painted red. Traditionally the frames would have been painted with horse blood but now red paint is used. Being a true bent-wood Yurt, as opposed to a straight roof Ger, the trellis walls are bent with a double curve giving the Yurt a unique and organic shape. The trellis is tied and fixed with rawhide, and are carved with a grooved design on the inside that helps with the steam-bending process. Each roof pole is from a whole young tree in the round, giving it more strength than square sawn timber. At the wheel end of the roof pole, the pole is made thinner and at the trellis end it is again carved with grooves. Kygyz steam bent Yurts tend to have quite steep roofs, with anything from a 30 to 40 degree pitch, much steeper that a Mongolian Ger, or an English steam bent yurt. The mountains of Kyrgyzstan would be much wetter than the dry plains of Mongolia. The Kyrgyz wooden doors are divided down the middle and open inwards. The softwood door panels are generally carved with a traditional Kygyz motifs. The elegant central wheel, or 'Tunduk' has a unique carved Kyrgyz bracing design. We love the Kyrgyz Yurts for their character and authenticity. They are truly beautiful yurt frames and the handcrafted felt is a wonderful organic product.. The only modifications we have made to the frames is using pre-stretched Polyester Cord for the ties at the end of the roof poles, rather than wool cord. We also paint the whole wooden frame with Yacht Varnish to protect it against mildew and rot. The Kygyz Yurts are measured in meters and the standard sizes we offer are the 4m (approx 13 ft), 5m(approx 16ft) and the 6m (approx 20ft) diameter, as we find these seem to work the best. Fitted canvas roof cover with reinforced double valance around the edge in between which the walls attach. The outer valance has a draw cord at the bottom to keep it tight against the wall. We have a range of extra options to suit your requirements including extra high walls, hardwood locking doors and windows in the side wall. All our Yurts are available with options of handmade felt insulation, inner covers, wood burning stoves and platform floors. 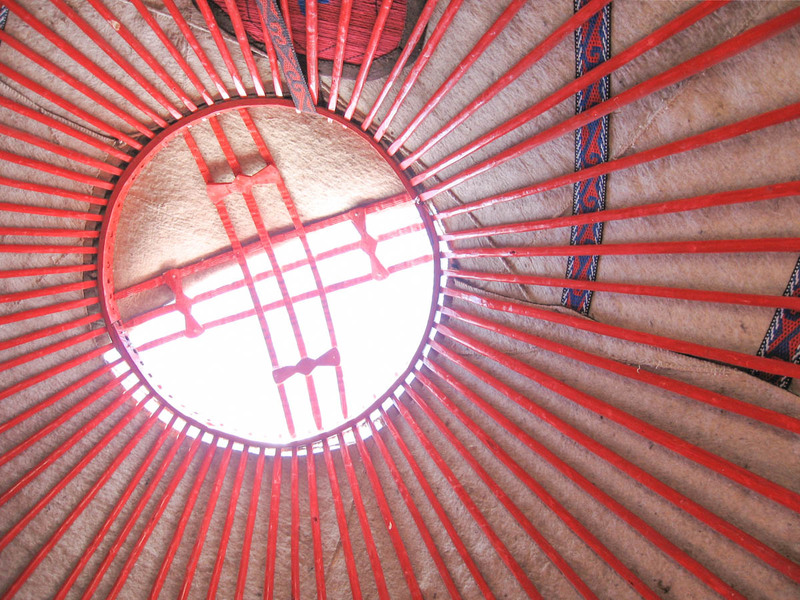 Kyrgyz Yurts come with one entrance way and a canvas door as standard. For additional cost, you can add additional doorways, or change a canvas door for a lockable wooden one. Kyrgyz Wooden Doors are made from panels carved with traditional Kyrgyz motifs. Each door is split vertically down the middle, as sharing the load of the door with hinges on both sides helps to reduce the incidence of distortion over time. The doors open inwards as that is the most weather proof design allowing the roof cover to overlap the top of the door. It is possible to add on an awning for over your door. This can be in the colour of your choice, and the style of awning may depend on whether your Yurt is semi-permanent or more portable. The awning makes it much more pleasant when coming or going in the rain, and adds an extra layer of weather protection to the Yurt over the door.